Pulling the front clip from the Chevelle. 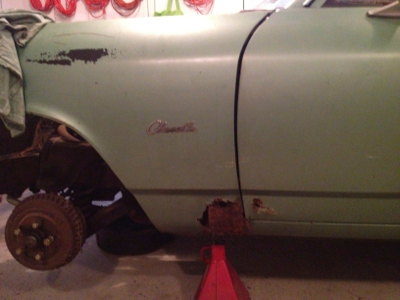 See that HUGE rust hole at the rear of the LF fender? That is causing me more heartache than I wanted. First I wanted to disassemble the front clip a piece at a time.. Which was going great until I ran into the two bolts that hold the fenders at the bottom, behind the wheels.. When I tried to simply remove bolts, the captive nuts behind them of course broke free. I was really, REALLY, hoping these would just come out. Alas, they did not.. So now I am down to two choices..
1.Cut the heads of the bolts off, thereby releasing their hold on the chassis. 2.Run the cutoff wheel right below the body line, again releasing the hold of the fender to body.. I thought to myself, ‘this is only one side’ and went to the other.. I’ll save you that torment.. Suffice it to say, it is much worse. Now I am onto pulling the front clip as an assembly.. It will make drilling the cutting the remaining nuts and bolts easier..